Young Statues’ Carmen Cirignano has one of the more distinct timbres to his voice of singers today, and one that can tend to dictate the overall feel of many of the band’s songs. But “The Covers EP” gives us a chance to hear that voice in various contexts of other’s compositions. These songs weren’t chosen to be replicated or reinvented, they were chosen to be honored, and it’s refreshing to hear some covers that weren’t just commissioned for a compilation. It all starts with Billy Bragg’s ‘A New England’, whose original romantic inspiration from two satellites back in 1983 and seeping British accent have been refolded into a dying-love duet. The exquisite choice of Tigers Jaw’s Brianna Collins fills the female role missing from the original (but filled by Kirsty MacColl on a later version), and it’s all enriched with new harmony and invigorated with an adventurous strumming rhythm. ‘Ashes and Fire’ takes Ryan Adams’ original, written in the recent-end of his career as the title track to his 13th full-length release. To Adams, it was a revival of his success and his happiness, an overcoming of disease and a way of fixing things many had thought he had broken in years past. While Young Statues’ take on the song keeps the folk rhythm, Carmen replaces those smoky vocals with his own resonance, sharp over smoothed-over percussion for an overall lighter cover. ‘California Girls’ takes the furthest depart from the original, where The Magnetic Fields’ tin and whimsical tone – inspired by the shoegazing beginnings of Jesus and Mary Chain’s debut “Psychocandy” – ditched the synths and reclined on feedback to support the song. 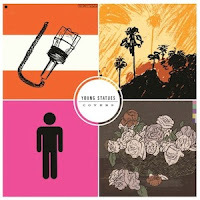 But Young Statues rely more on an acoustic-electric guitar pairing and a steadier, more pristine backing tone for a much less monochromatic take on the song. Finally, the EP is bookended by more Britpop from the golden year of 1983 with ‘Age of Consent’, lifted from New Order’s “Power, Corruption & Lies”. Its bassline is a favorite behind sparks of guitar, moments of leading synth and a repeating melody that grabs more attention than the vocals. But Young Statues heavy-up the guitar a bit and the band really utilize the studio to their full advantage, especially on Cirignano’s vocals – centered, pulled through muted distortion, wavering between the left and right channels. The band pull-off maintaining the precipice of tension heard on the original, however, as the repeating optimistic melody never fully builds or descends. It’s the best cover on the EP, not because it’s the most innovative, and not because it’s the closest replica, but because Young Statues are one band the song was meant for. As a collection, these songs are the personal insights into inspirations for Young Statues; they’re proof that a genuinely-played cover can mean as much as an original. “The Covers EP” is out on December 4th through Run For Cover Records.